Varicose veins are tortuous dilated segments of vein associated with valvular incompetence. 98% of varicose veins are primary idiopathic varicose veins. Secondary causes may include deep venous thrombosis, pelvic masses (e.g. pregnancy, uterine fibroids, and ovarian masses), or arteriovenous malformations (such as Klippel-Trenaunay Syndrome). The Edinburgh Vein Study showed an age-adjusted prevalence rate for varicose veins of 39.7% in men and 32.2% in women, with around 40% of women affected during or after pregnancy. Further work has demonstrated that the risk of varicose veins increases every year by 1.9% in men and 2.6% in women. 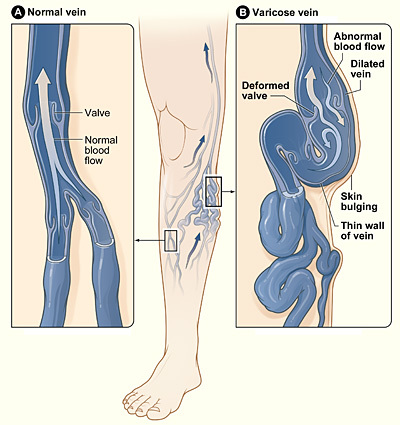 Figure 1 – Varicose veins develop from valvular incompetence, resulting in dilation of the superficial venous system. Worsening varicose veins may then cause pain, aching, swelling (often worse on standing or at the end of the day), or itching. Subsequent complications may include skin changes, ulceration, thrombophlebitis or bleeding. On examination, varicosities will be present in the course of the great and / or short saphenous veins. A saphena varix is a dilatation of the saphenous vein at the saphenofemoral junction in the groin. As it displays a cough impulse, it is commonly mistaken for a femoral hernia; suspicion should be raised in any suspected femoral hernia if the patient has concurrent varicosities present in the rest of the limb. These can be best identified via duplex ultrasound and management is via high saphenous ligation. Gold standard for varicose vein investigations is via duplex ultrasound (best done by a trained technician), assessing valve incompetence at the great/short saphenous veins and any perforators. Deep venous incompetence, occlusion (deep venous thrombosis) and stenosis must also be actively looked for. If a patient is identified to have a concurrent DVT, you cannot treat their superficial incompetence, as the venous blood will have no route back. Consequently, any patient with deep venous incompetence is typically offered non-surgical management. Patient education is very important, such as avoiding prolonged standing, weight loss, and increase exercise (promotes calf muscle action). NICE guidance only recommends the use of compression stockings if interventional treatment is not appropriate. This is because compression stockings are good at preventing complications of varicose veins but need to be worn for the rest of the patients life. Any venous ulceration from deep venous incompetence generally requires four-layer bandaging (graduated compression aiming to move blood from distally to proximally), unless there is evidence arterial insufficiency. Vein ligation, stripping, and avulsion – making an incision in the groin (or popliteal fossa) and identifying the responsible, refluxing vein, before tying it off and stripping it away. The surgeon must be aware of surrounding arterial and nervous structures, such as the saphenous and sural nerves. Foam sclerotherapy – injecting a sclerosing (irritating) agent directly into the varicosed veins, causing an inflammatory response that closes off the vein (Fig. 3). This is done under ultrasound guidance to ensure the foam does not enter the deep venous system, however this method only requires a local anaesthetic. Thermal ablation – which involves heating the vein from inside (via radiofrequency or laser catheters), causing irreversible damage to the vein which closes it off. This is done under ultrasound guidance and also may be performed under local (or general) anaesthetic. Figure 3 – Foam sclerotherapy, performed under ultrasound guidance. Untreated varicose veinswill worsen over time and indeed many patients who have treated varicose veins often require re-intervention surgery. Whilst the complications will be specific for each procedure, typical complications seen post-operatively include haemorrhage, thrombophlebitis (important for foam or ablation treatments), DVT (important for any endovenous treatments), disease recurrence, and nerve damage (specifically saphenous or sural nerves). Which term describes the tapering of the legs above the ankles (“inverted champagne bottle”)? What is the gold standard investigation for suspected varicose veins? Which investigation should be performed prior to compression bandaging? Which of the following is NOT a complication of varicose vein surgery? What is the characteristic location of a venous ulcer?